When I was pregnant, I could never remember how many weeks along I was. Having a little browser applet helped (since I work so much at the computer), but it was rather impersonal. This is when the idea of pregnancy tracking necklaces came to me. Something I can touch and cherish, something to connect me with the changes my body was going through, and to be there after as a keepsake for the baby and a memory for me. 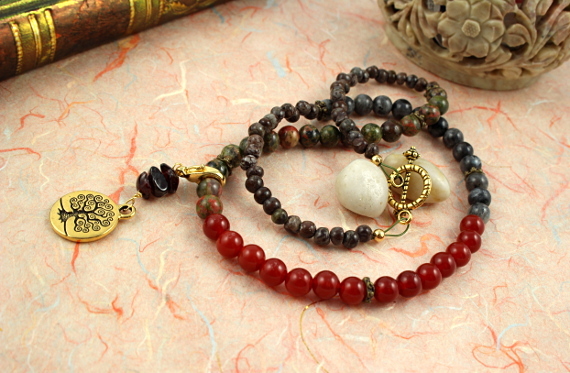 Semi-precious gemstones seemed like a perfect medium: with their earthy feel, uniqueness of each bead, and slight variations in size, such a necklace would be a truly one-of-a-kind treasure. 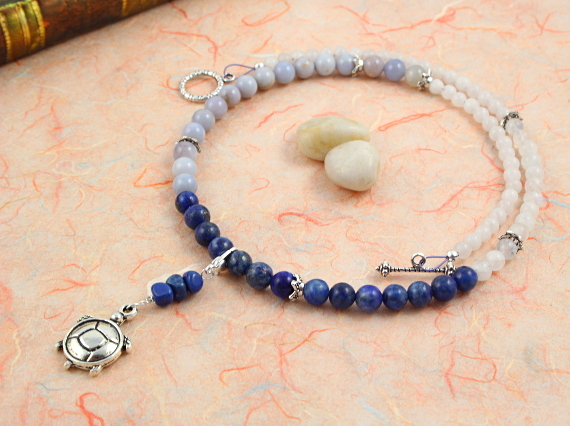 There is something therapeutic in holding and playing with the beads – after all, mala and rosary beads have long been used for focusing on one’s thought in prayer or meditation. 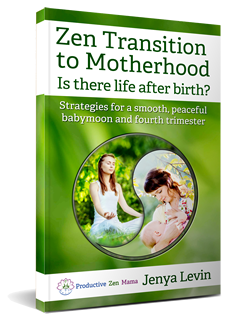 Additionally, some gemstones are associated with qualities helpful during pregnancy. For instance, red carnelian is said to stimulate and balance the female reproductive system, reduce stress and anxiety, and help protect against miscarriage. Snow quartz promotes peaceful sleep and soothing dreams, and is associated with empathy and harmony. Labradorite symbolizes the moon and the sun, and is known for promoting strength, reducing stress and anxiety, assisting with digestion, and transformation. 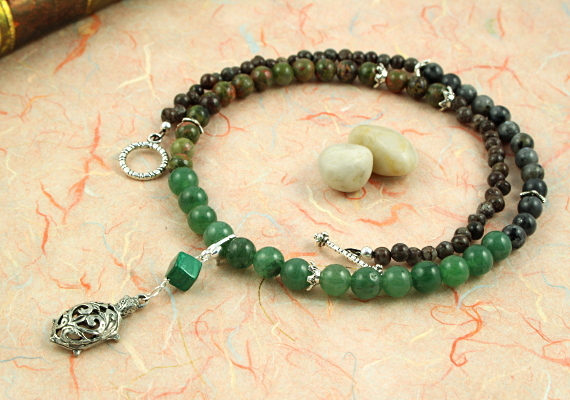 Green aventurine is said to bring love, promote luck, optimism, self-confidence, and happiness, encourage pregnancy and enhance fertility. 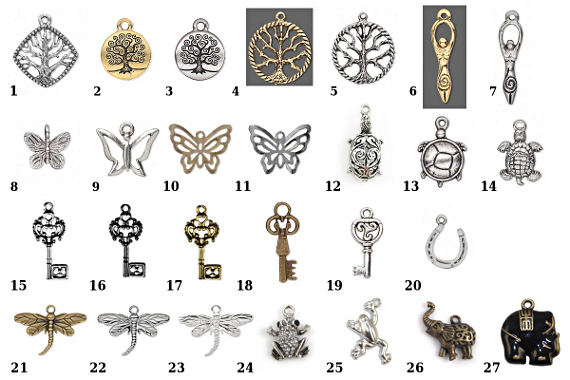 Since pregnancy is so different for every woman, I also thought it would be nice to offer a selection of charms, so that every mama can find the one that appeals to her. I have also made sure to allow the count to go up to 43 weeks. Many healthy pregnancies do not follow the imposed time guideline of 40 weeks, and the estimated due date is just that – an imperfect estimation often based on imprecise knowledge of the conception or LMP date. At the end of a pregnancy, the last thing a mama needs is stress, and I wanted my pregnancy tracking necklace to add a grounding and reassuring element to the excitement preceding birth. And so I have gathered a variety of beautiful gemstones and set off to experiment with colour and texture combinations. I must say, having worked with beads for a while now, handling gemstones has a different energy to it. I feel more grounded and calm, the stress tends to melt away, and inspiration comes easily. I have now created over 10 different designs of pregnancy tracking necklaces (including a couple of custom ones), and out of all the ones I’ve made so far, I think Milky Way necklace is the one I would love to use myself. With the rainbow moonstone showing iridescent blue, lapis lazuli bringing in many shades of darker blue, followed by the gentle milky blue of chalcedony, this would be my favourite colour combination. Also, chalcedony is said to promote lactation in nursing mothers, so I used it for the third trimester, when the milk comes in. To remind mamas how to use their necklace, I have created a card with an illustration and an example. The only involved part is calculating the start day of your pregnancy, which only needs to be done once. I will cover this calculation in another blog post. However, once you know the start day, the only thing to do is to move the charm one bead further on the same day of the week. Although I myself would likely have an urge to play with the stones of the necklace a lot more than once a week. Just writing this post has me yearning to pour myself a cup of tea, open up the treasure chest of gemstones in my studio and delve into creating more necklaces.